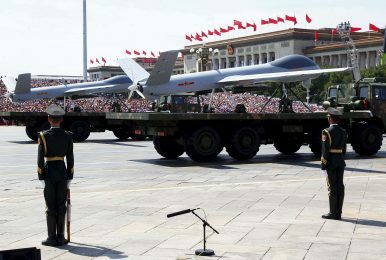 Chinese unmanned aerial vehicles are presented during the military parade marking the 70th anniversary of the end of World War II, in Beijing, China (September 3, 2015). Expect China to add drones – little grey (un)men – to its arsenal of hybrid warfare tactics in the South China Sea. Beijing has always paid close attention to the military activities of other nations, drawing lessons from their successes and failures, and applying the lessons to its own political and military strategies at home. Beijing has also undoubtedly drawn from Russia’s recent “successes,” and (re)embraced the concept and practice of modern hybrid warfare. In recent years, China has made bold steps to reassert its claims of sovereignty and presence over a strategically vital region. Tactics and strategies such as “salami slicing” and the cabbage strategy, have become the mantra in the South China Sea (SCS), mixing government-supported psychological warfare with violent (covert) operations. China’s actions can be increasingly observed in a grey area situated between politics and violence (or war). In this regard Putin’s little green men are not operating much differently than Mao’s revolutionary fighters, or Castro’s guerilla fighters some six or so decades ago. North Korea’s naval actions against South Korea in the past several years, such as the sinking of the ROKS Cheonan also distinctly smacks of hybrid warfare. China’s fishermen-turned-state-sanctioned-militia, too, fit perfectly into this hybrid framework: Operating primarily as a civil fishing fleet, but with military training, and conducting (para)military operations. They easily disappear into civilian shade at will, becoming Mao’s fish in the sea. The term hybrid warfare tends to be applied to situations on land but attention is increasingly turning to the use of maritime hybrid warfare. Despite the obvious geographical difference, hybrid warfare or littoral guerilla style warfare functions in much the same fashion as land-based operations. There are several important distinctive advantages for states actively pursuing littoral hybrid warfare activities. The maritime battlespace offers the opportunity of convergence, the blending of conventional and non-conventional forces and force capabilities. A rich line-up of tactics and strategies (that can be described as “multi-nodal”) enhances an actor’s operational spectrum. The prior mentioned fisherman-turned-paramilitary militia is a prime example of how China has sought to increase its influence over the SCS through the use of non-linear or “multi-variant” forms of warfare. In a recent article for the US Naval Institute journal Proceedings Admiral James Stavridis argued that we are on the brink of further Chinese hybrid warfare actions. The U.S. Naval War College’s Andrew Erickson also argued along similar lines. Given China’s recent action, political language, and expert assessments of the broader picture, one might expect to see China supplement Putin-esque “little green men” with a handful or more of “little blue men.” Such a scenario necessitates further discussion, particularly given that Russia’s achievements in Ukraine have illustrated just how critical understanding the concept of hybrid warfare is for building the requisite foundations of an effective counter-strategy. However, the current “little blue men” focus remains too restricted and consideration therefore should be made toward enlarging the scope of modern hybrid warfare: It should include the concept of “little grey (un)men” that we presented in a prior article for The Diplomat. In this article, we argued that China’s capture of one of the United States’ “little grey (un)men” — an unmanned buoyancy glider — served to highlight U.S. efforts to look to the use of unconventional forces, such as unmanned systems, in the battlefield as instruments capable of countering threats other than terrorists and insurgents. However, the possible hybrid, unmanned effort by the U.S. is not a one-way street. As much as the United States could pursue such strategies in the future, China could also enhance its little blue men with a fleet of flying, sailing, swimming “little grey (un)men.” Proving the origin of many deployed unmanned systems could prove extremely difficult because they might not have any national markings on them. Unmanned systems can effectively afflict an actor with inattentional-blindness. Their above/on-the-water counterparts, unmanned surface vehicles (USVs), are also ideally suited for operations in which a visual presence is a requisite condition, such as sailing through contested waters and conducting incursions in an opposing nation’s exclusive economic zones (EEZs). In addition to political purposes, unmanned systems like those described here can be used for offensive (military) purposes. Used in combination with swarming tactics, they could surround commercial, military, and paramilitary vessels. With no national markings, and devoid of personnel onboard, the possibilities for (direct) communication are almost nil. This ambiguity in communication could lead to a great deal of confusion and miscommunication between two or more hybrid actors, raising the possibility for violent conflict between states operating the systems. The apparent lack of diplomatic interaction compels opposing actors to settle on a limited framework of counter-options: ignore a given vessel, risk collision and possibly destruction, or face the potential of violent encounter. Alternatively, the decision could be made to stand down and allow an incursion to take place even though this would mean running the risk of losing in a larger political battle. Take China’s capacity for large-scale building, its experience in hybrid warfare, and couple it with small and relatively inexpensive hybrid instruments, and it becomes apparent that an extensive range and application of unmanned systems will likely pose a daunting challenging threat to the security architecture of the SCS over the coming decade.